The empowerment of the working people of Chile was at the heart of Allende’s vision. Even when the country was under severe attack by the United States, the issue of industrial democracy remained firmly established. In August 1973, a month before the brutal coup, Beer asked Allende to what extent he expected worker control of the social economy. He replied “El maximo”. For this to work, the usual approach of command and control must be replaced by a pattern of relationships which are based on continuous flows of information, and thus a crucial element of Cybersyn was to run the entire national economy in real time, and thus give Chile the most advanced system of governance on the planet. The project started in the middle of an economic crisis, when inflation was rising dangerously and there was massive international opposition to Allende’s government. Recently declassified documents reveal that Nixon ordered the CIA to ‘make the economy scream’. The economic blockade by most of the developed world provided the context for the entire project. The system would support worker’s participation, decentralisation and reduce bureaucracy. In a social economy, such as Chile under the Allende government, improved performance for industry would also mean improved benefits for the workers, rather than escalating inequality. The Cybersyn project had four sub-projects. A system to collect performance indicators from production plants, examine the flow of data for algedonics, and send the information directly back to its source to encourage self-regulation. The system would support decision making to provide the required resources and support to alleviate any crises. It included the computers and software to process performance indicators from each factory and sector of the economy. The software, known as Cyberfilter, provided statistical filtration, based on time series analysis that could forecast incipient instability and generate algedonics, early alarm signals. It was a joint pioneering effort between Chilean and British engineers and scientists. A sub-project that created a communication network between factories, state enterprises, sector committees and the state government, using an existing telex network previously used to track satellites. They expanded the existing network to include every firm in the nationalised industries; it was intended to serve as a real-time economic control tool and transmitted data once every day. Raul Espejo recently revealed that at the beginning of the project, someone discovered a warehouse full of unused telex machines and these provided the hardware on which Cybernet was based. Aimed to model the Chilean economy and provide tools to simulate and forecast possible behaviours. It provided an experimental laboratory for the government and used the Dynamo software created by Forrester in MIT, originally with available statistical data. The intention was to feed the simulation with the real-time data flowing in from Cybernet. An environment for decision making where a team of people met to analyse real-time data and make decisions on priority issues, based on real-time early alarms (the algedonics mentioned above) and results from the CHECO simulations of the economy. The room was equipped with networked computers and electronic screens to access the performance indicator software (Cyberfilter), which produced early warning signals generated by algedonic filtration. Based on the shared real-time information platform, participants would make decisions and act accordingly. Although the prototype was built in Santiago in 1972, it never became operational but had a significant influence on the imagination of those who saw it and became a symbol of the spirit of the project. It should be noted that there were only two computers in Chile at that time, and that most of the information was relayed by the Telex system. Beer was always adamant that the technology is a secondary issue: the critical factor is to get the science right. In Chile some of the remote factories had to transport their daily figures by horse to the nearest Telex station. The first stage of the project was to carry out the recursive mapping and agree on each one of the embedded sub-organisations in the nation state, responsible for industrial activities. In order to clarify this level of recursion, the project team needed to thoroughly understand the organisation of the nation state. The initial representation they agreed at the project was as follows: the highest recursion is the Constitutional Regulatory System of the country. It includes (at the next recursion) ministerial government, communities, the ‘wealth producing’ industries, public and private. 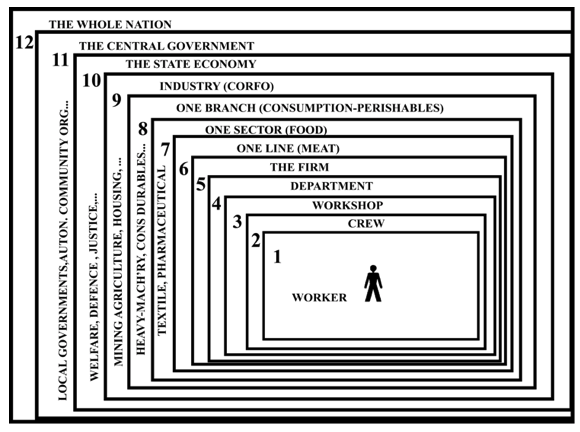 If we select from this recursion, for example, the industries, then we can detail (at the next recursion) water supply, energy supply, mining and so on. If we then choose energy, then we can represent its next recursion as oil, gas, electricity, and so on. Here is one representation of the recursions in Chile produced by Schwember, a member of the Cybersyn team. At lower levels of recursion, they modelled individual plants responsible for industrial outputs and their interactions with their local environments. Once these models had been built, they provided a shared modelling and regulatory language. By designing information systems to measure organisational performance at each level of organisation using the same set of performance indicators, it became much easier to produce a synthesis of what was happening throughout the nation. The next step was to model each of the productive processes in the Chilean economy and to produce ‘quantified flow charts’ (QFCs, a traditional operational research modelling tool) for every wealth-producing component of the nation That implied the need to decide on critical issues for effective performance in each productive process, at each level of recursion. A massive training program was organised by the Cybersyn team involving workers and managers from all levels to decide on such critical indicators and their acceptable/ expected behaviours. Again, it should be stressed that the identification of KPIs involved the workforce who, in general, understood the critical factors of every production process. Once critical variables were identified, indicators were generated using the ‘triple index’ measurement system, including measures of ‘actuality’, ‘capability’ and ‘performance’. Core to the project’s aims was to find an alternative way of measuring organisational performance in a unified and simple language. By using the VSM as a unifying modelling language across the nation, at each level of recursion, and the system of QFCs, the teams could agree on relevant performance indicators from each wealth-producing organisation and process. Once they collected the data and observed them for periods of time, they began to identify and react to bottlenecks in their operations, with the help of the Cyberfilter software. The Cyberfilter task was to detect incipient instability, and thus enable corrective action before there was significant damage. It calculates the probability of chance variation, transient, changes of slope or step changes using Bayesian time analysis series. The sensitivity level acceptable for each essential variable and the deadlines for reporting alarms to upper Meta-systemic levels are agreed at the 3/4/5 Homeostat of the respective recursive level of organisation; and their acceptable levels of sensitivity to changes negotiated through the accountability channel, at each coupled level of recursion. Each manager helps to decide on the required ‘elapse time’ to correct any problems or instability and this is defined as part of the’intervention rules’. If action was not effective within this ‘elapse- time’, then the Cyberfilter software was designed to send an algedonic signal to the next recursion upward to alert managers that the situation was out of control at lower levels of recursion, and that they needed to get involved and mobilise a support net- work. This system put into practice the concept of intervention rules: a S1 is autonomous only as long as it works within the constraints set by the needs of the whole system — the intervention rules define the terms under which autonomy is forfeit in order to preserve whole system cohesion. Properly designed and implemented this system will support self-regulated and self governed autonomous units nested at different levels of recursion. The technology is used as an enabling technology to support bottom up self governance. The government also collected and processed data for the essential variables of the sectors — as close as possible to real time given existing technological constraints — and produced ‘early alerts’ on the ongoing dynamic and trends of each industrial sector and sub- sectors. The Cyberfilter was fully working in 1972. To put the whole process of training staff from the organisations within the Chilean industrial sector into focus, modelling each of their organisations and processes (their S1s), defining the performance indicators and creating the communication and technological infrastructure for analysis and decision making on performance management issues took about a year. Between them, these initiatives constituted the set of managerial performance systems used to estimate how well the industries were doing in providing services to people and businesses, and also served to establish the control loops to regulate the entire Chilean economy. Not all the historical reviews of this pioneering project coincide in understanding deeply the cybernetics basis of the whole design. Some commentators have suggested that the technologically based Cyberfilter and the operations room were designed to offer more control to the government than to the workers, (Medina, 2006). Such commentators seem to have missed the fundamental issues of self governance illuminating Cybsersyn’s design from the very fundamental basis: it was a self governing, and inclusive social experiment, rather than the technocratic dream of a few experts, as they argue. Beer considered that there were two critical aspects to measuring the way a nation state was performing: one was the performance indicators from the S1s, and the second the eudemonic measurements of citizens’ well-being. 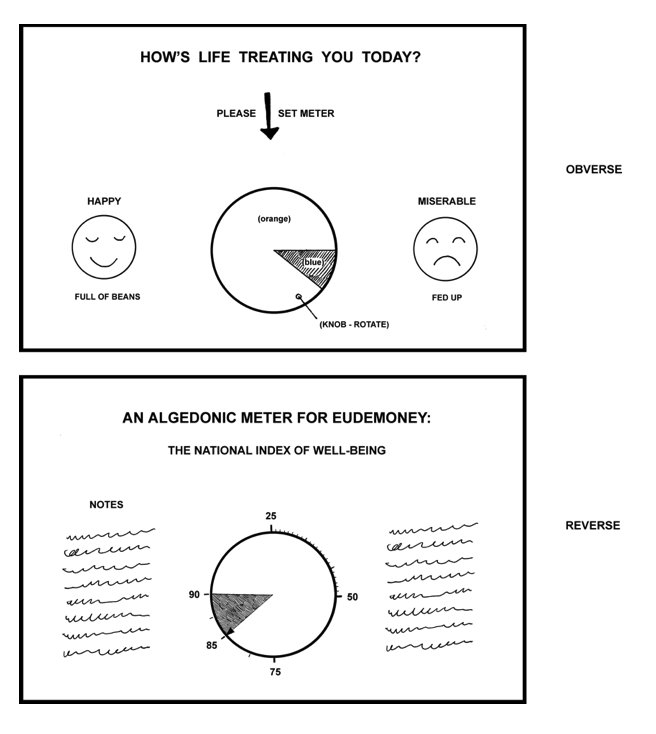 He suggested the use of an ‘algedonic’ metre to measure eudemony, or how well people feel in general. This is a simple device which is given to people on the street who rotate the knob until the blue and orange segments of the circle provide an indication of how they are feeling. The researcher then turns over the device and reads off the two-figure digit, which provides the eudemony measurement. The system does not threaten people and can express very simply how well they feel at a particular time. The individual eudemony figures were intended to be fed into the information network so that they could be amalgamated to show how happy people were feeling at all levels. Ultimately a representation of the happiness of the nation would have been produced. The system was designed to work during governmental broad- casts. As the speech or programme progressed, Chileans with the algedonic meter would signal their response by turning the meter. These signals would be amalgamated and sent to the Presidential Palace, so that the government would know in real time how the citizens were reacting to the broadcast. The system was designed as a massive variety attenuator of people’s eudemony. Gremios were trade associations that controlled the majority of the transportation network in Chile. They were generally of middle-class origins and not supportive of Allende’s initiatives to redistribute wealth to the poorest people in Chile. In 1973, the CIA persuaded the Gremios to strike and thus bring to a standstill the vast majority of the transportation system in Chile. After a few hours, algedonic signals began to flood into the capital, and the Cybernet systems were immediately taken over by the government. A temporary control centre (the operations room had not been completed) was established next to the communications room and began to receive demands for transportation. Supplies were needed in manufacturing plants. Food had to be delivered to shops. Patients needed to get to hospital. Due to the real-time design of the system they knew exactly what needed to be moved, and the location and availability of the few remaining trucks (from the army, ambulances, etc.) that were under the control of the government. After 24 hours everything important had been delivered and the strike was abandoned. Beer estimates that this was achieved with between 10% to 30% of the normal transport capacity of Chile. The response to the Gremios strike demonstrates the power of the Cybersyn experiment. One senior minister stated that the government would have collapsed without the cybernetic tools. Despite the unfinished network, the use of Telex machines, and the lack of a finished operations room, the real-time data enabled the government to respond to the crisis and overcome the problem. The project ended dramatically, when President Allende was killed during the presidential coup in 1973 and Pinochet’s military dictatorship took power. They immediately destroyed all elements of the Cybersyn project which was diametrically opposed to the imposition of brutal centralised control.